Until iOS 8, the only ways to view the desktop version of a website in Mobile Safari were to hope that the website you were visiting either offered a working "desktop version" link, or would allow you to visit the desktop URL without automatically redirecting you back to the mobile version. This annoyed a number of users, especially when sites which would ordinarily render perfectly well in Mobile Safari instead force-fed a feature-crippled mobile version. Third-party browsers like iCab offered the ability to change their user agent string— in effect, masquerading as Safari on OS X— but they couldn't match Mobile Safari's integration with iOS. 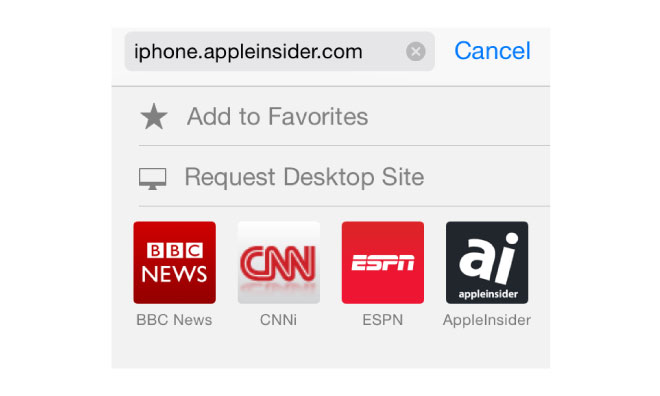 Apple has now addressed those concerns with a new button titled, aptly, "Request Desktop Site." To use it, simply load any website that automatically redirects you to its mobile version. Tap the address bar to bring up the Favorite menu, then swipe downward on the icons— this will reveal the new "Request Desktop Site" button. Tapping the button will reload the page, and in the process automatically alter Mobile Safari's user agent string. The desktop user agent will persist within that website— even after refreshing —but navigating to a different site or switching to a new tab will reset it.